The Motorola Droid Razr is yet another very good Android phone running on Verizon's super-fast LTE network. Buyers will also be pleased with its bright, high-contrast display and quick navigation, thanks to its 1.2 GHz dual-core processor. But what sets the new Droid Razr apart from its competition is the extremely thin, extremely tough case that all those features are packed into. With a Gorilla Glass front, a Kevlar back and water resistant innards, the Razr should stand up to abuse that would leave other phones permanently out of commission. Like other Motorola phones we've tested, including the Droid Bionic, the main disappointment is the camera. And battery life isn't a standout either. So there is a trade-off for that compactness. The Motorola Droid Razr is very light for its size. At only 4.48 ounces, it's more than an ounce lighter than the Droid Bionic. It's also extremely thin, measuring just .28-inches, except for the small hump at the top - it fits perfectly into a pants or jacket pocket. But if you have small hands, you may find the Droid Razr too wide to use comfortably, as I did. While the overall feel of the phone is solid, the buttons feel downright cheap, especially the wiggly, sharp-edged power button. Ironically, the sharp edges actually make it slightly easier to find with your thumb, but it is still not an appealing feel. 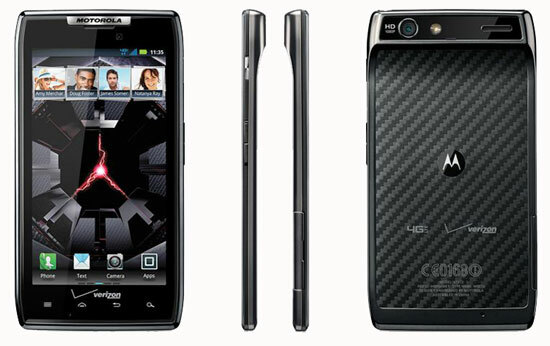 The Motorola Droid Razr has a very nice 4.3-inch Super AMOLED Advanced qHD display (960 x 540). There's plenty of brightness and excellent contrast, with the wide viewing angles you would expect from an AMOLED display. And it's made from Gorilla Glass, which makes it virtually scratch-proof. The built-in speaker on the Droid Razr was loud and clear. Standard calling volume was good as well. The Motorola Droid Razr uses Verizon's 4G LTE network for blazingly fast download and upload speeds. In New York City, I regularly get download speeds of 13-17 Mbps (with a peak of 22 Mbps), and upload speeds from 5 - 7 Mbps. That's about 10-15x faster than I get using Verizon's 3G network, and a strong reason the get the Razr over a 3G device, including the iPhone 4S (see: The Fastest 4G? It's No Contest for an idea of how much you get with a 4G versus a 3G phone). Combining that 4G speed, with the Razr's powerful 1.2 GHz dual-core processor and beautiful display made for an excellent browsing experience. The Motorola Droid Razr can act as a mobile hotspot for up to 8 devices. Like the Motorola Droid Bionic, the 8MP rear-facing camera on the Razr is disappointing. It takes a long time for the camera to focus, even is bright light, which means lots of out-of-focus shots in low-light situations. Noise in low-light shots was also quite apparent. And in better light, colors were washed out, though they had a nice level of detail. Video quality was not much better. The 1080p HD video was also washed out and the camera had trouble finding the correct subject to focus on. At least the video was stutter-free, but not without jiggliness in the image. The Motorola Droid Razr is running Android 2.3 Gingerbread and MOTOBLUR. The processor keeps everything flowing smoothly and navigation is well designed. Both multi-touch and Swype keyboards come pre-installed. One new feature that many users will find quite appealing is the ability to create "Smart Actions", rules that let you do control a range of functions from power saving to ringer volume to app launching, based on your location or time of day. The rules are composed of "Triggers", such as arriving home, and "Actions", such as turning off 4G and turning on Wi-Fi. Creating the rules is as simple as identifying your Trigger(s) and clicking on the actions you want to occur. The Motorola Droid Razr has 16GB of onboard memory and includes a 16GB microSD card (expandable to 32GB). Battery life on the Droid Razr was not so hot. The phone will go 24 hours under light usage, but if you're browsing, chatting and running apps, don't stray far from a charger by evening time. And the Razr's battery is not removable, so carrying an extra is not an option. UPDATE 12/2/11: My impressions of the battery life have gotten worse as I've been able to clock more usage. I'm finding the phone can be dead in as little as seven hours with normal use - and that's not acceptable. I am lowering my recommendation to neutral as a result. I also found charging the Razr by USB to be unusually slow. Getting from 10% to a full charge took nearly seven hours. Like other advanced Motorola phones, the Droid Razr can use an accessory Laptop Dock, which can turn the phone into a mobile computer. The Motorola Droid Razr is available from Verizon for $299.99 with a new, two-year customer agreement. Or, you can purchase it from AmazonWireless for $199.99. The Droid Razr is a feature-packed phone with a fast processor, beautiful display and 4G LTE speeds (a must on Verizon) that innovates in some very useful ways. The water-repellent nanocoating inside helps protect it from life's little unpleasantries, and the Smart Actions will be a godsend for those who need to change setting between work and home, day and night, or weekday and weekends. And the thinness and light weight are a pleasure if you carry you phone in your pockets like I do. That said, there are some downsides. Those with smaller hands may find the Razr's girth too much of a stretch, battery life is nothing to call home about and the camera could be better - a lot better. Overall, though, the Razr is a solid choice. And I've seen it go as low as $.01 on sale on Amazon. If you can jump on another deal like that, it would be a steal. The best phone i have ever used much better than the thunderbolt i traded in at the same price. I like the razor wayyyyy better than most of the other phones that i have had from droid!